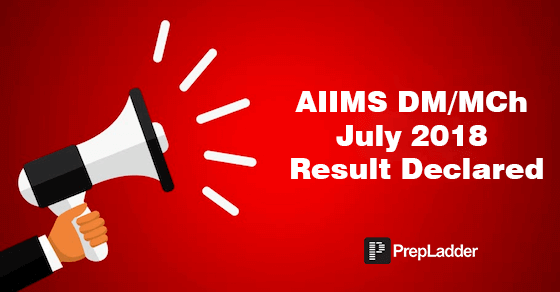 All the candidates who participated in AIIMS Entrance Exam held on 7th April’18 (Saturday) for DM/MCh courses July 2018 admission session must pay attention. The result for DM/MCH courses Stage-1 has been declared. The candidates are required to report to Departmental Clinical/ Practical/ Lab Based Assessment on the date/s, venue & time as indicated against each course. For each available seat, out of the qualified candidates in Stage-I Examination, three times the number of candidates have been called for Departmental Assessment subject to availability of candidates. The total number called may therefore vary depending on the number of qualified candidates and tie cases. Certificate/ Documents in support of Ex-Army Personnel/Ex-Serviceman/ Commissioned Officer including ECO,SSCO. Any other document/ certificate as mentioned in the prospectus for the respective DM/ MCh courses. The facility for uploading certificates/ documents will be available from April 13, 2018 (Friday)onwards. The last date for uploading Certificates/ Documents will be April 18, 2018 (Wednesday) upto 5 PM. All the original documents will be verified at the time of Department Assessment. Candidates without original certificate/ documents will not be permitted to appear for the Departmental Assessment. All candidates are also required to note that the selection/ outcome of the Examination is subject to fulfillment of eligibility and other requirements as mentioned in the Prospectus.